Salad | Izzy have you eaten? Until you causally mentioned it Izzy, it had never occurred to me: Aussies don’t generally eat salads the way Americans do. What comes to mind for an Australian when you say ‘salad’ is usually the equivalent of an American side salad: mixed greens with a light dressing. A salad is the most common thing anyone we know in the US eats for lunch these days. But it isn’t just a plate of mixed greens. In the early days, with the great enthusiasm of making a healthy salad ‘hearty’, American chefs overdid the whole idea: tons of creamy dressing, lots of cheese and chopped egg, meat, and croutons. Californians have it down pretty good, we think: there is always a decent ceasar to be had. There are great mexican riffs with black beans, crumbled tacos and jalapeños. Maybe a Chinese chicken salad? It has asian cabbage cut in a slaw with carrots, shredded chicken and maybe bean sprouts. The dressing is usually honey and soy. A little predictable, but quite delicious. When you were out with friends, Izzy, it was usually sushi and miso at Taiko in Brentwood Gardens. And if not, it was a salad with warm felafels from the Countrymart, or your favourite chopped salad from California Pizza Kitchen. Now I quite often make Claudia a hearty salad to take to school for lunch. It consists of a mix of the greens I have in the fridge (baby spinach, arugula, and romaine usually). Toss in some cherry tomatoes, chopped cucumber, and a handful of whatever fresh herbs you might have. Maybe a handful of edamame, if you have some. Then the ‘hearty’ bit which helps her go the distance in a long school day: some left over chicken curry pieces, or meat. I lift a few pieces out of the sauce it is in, and pull the pieces apart (a shred is much nicer to eat than cubed or chopped meat in a salad). I toss it all together with olive oil and a squeeze of lemon. It really does make for a delicious lunch. And satisfying! The other day we picked up your sister from school and took her down to the Forest Hill shops for lunch. We thought we’d try out the new Café Aroma. I ordered the chickpea salad, and immediately thought I should record the ingredients for you. 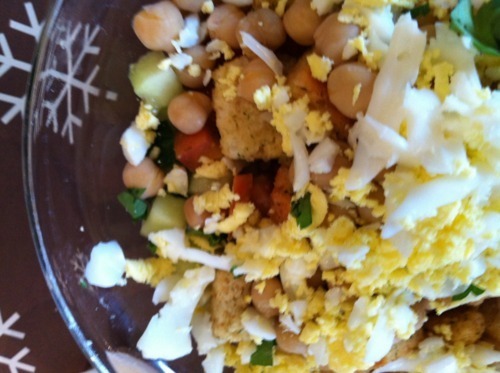 We all know how much you love chickpeas…. Toss all the ingredients together and dress with sparing amounts of olive oil and lemon juice. If you are making it to eat later, remember to add the dressing at the last minute!